I love seeing so many colleges expanding, etc. There's a lot of building going on with NYU, Columbia, Brooklyn Law, and many others. It's such an important, often overlooked part of the city. Doesn't downtown Brooklyn have more students in the area than Boston/Cambridge? Fiterman Hall at the Borough of Manhattan Community College was a month away from reopening when it was damaged by debris from 7 World Trade Center. Through much of the ground zero precinct, hope is measured in the promise of construction. At Fiterman Hall, hope will take the form of demolition. While plans have been laid for the Freedom Tower, a memorial and the permanent PATH station, the Borough of Manhattan Community College has tried to emerge from the shadow of Fiterman Hall. This freshly renovated 15-story classroom building was a month away from formally opening when 7 World Trade Center collapsed across Barclay Street. The toppling skyscraper clawed away at the building's wedding-cake tiers, set blood orange fires within its white brick walls and piled a mountain of ruin against its facade. Since Sept. 11, 2001, Fiterman Hall has stood like a ravaged ghost, its skeleton alarmingly visible. Increasingly incongruous amid the scenes of revival playing out around it, it is a dispiriting reminder of a day its neighbors long to put behind them. Now, Antonio Pérez, the college's president, says he is intent on demolishing Fiterman Hall and replacing it. "It has to come down," he said in an interview on Monday. "It has to be rebuilt, and it has to be rebuilt soon." Though there had been talk of trying to salvage what remains of Fiterman Hall, Dr. Pérez said inspections showed that the weight of debris from 7 World Trade Center leaning against several stories of the building had irreparably compromised the structure, particularly at the points of connection between columns and beams. Dr. Pérez envisions a new hall - also named Fiterman in honor of the original donors, Miles and Shirley Fiterman - that would have more usable floor area than the old building, which was a renovated 1950's office tower. There would be commercial space on the ground floor; a small plaza on the south side, opposite a triangular park in front of the new 7 World Trade Center; and, if possible, more than 15 floors. How many more? "It's hard to go shopping," Dr. Pérez answered, "until you know how much you have in your wallet." "The city and state have been very supportive to have this move forward," he said. Meanwhile, the badly overcrowded college - where students attend some classes in trailers parked along West Street-Route 9A - will gain some breathing room this year by opening what amounts to a 186,000-square-foot annex in an office building at 75 Park Place, one block north of Fiterman Hall. Both Fiterman Hall and 75 Park Place occupy land that was set aside for academic ends in 1755, when Trinity Church granted the parcels to the fledgling King's College, now Columbia University. Its tiny campus was immediately to the east. Long after moving uptown, Columbia continued to own the property, known as the Lower Estate. In fact, Burton P. Resnick of Jack Resnick &amp; Sons, developers of 75 Park Place, bought the site directly from Columbia in 1981, the first time it had changed hands since New York was ruled by King George II. The community college, a unit of the City University of New York, will occupy a building within a building at 75 Park Place. It will have its own entrance on Murray Street, leading to escalators that will take students to a second-floor lobby, where they will board any of five elevators dedicated to the college's classroom, office and training floors. "My office tenants won't even know they're there," said Scott N. Resnick, president and chief operating officer of Jack Resnick &amp; Sons. The largest tenants are R. R. Donnelly Financial and the New York City Office of Management and Budget. The college will pay $75 million over its 10-year lease, Dr. Pérez said, a figure that includes the cost of constructing its space. The architects are Moed de Armas &amp; Shannon. It was no easy thing to cobble together nearly 190,000 square feet of space, Scott Resnick said, since he technically had only 35,000 square feet of space available on the fifth floor when he was approached by the college's real estate brokers, Richard P. Levine and Joseph P. Whitaker of C. B. Richard Ellis. They were looking for space within a 5- or 10-minute walk of the main college building, a megastructure that stretches nearly five blocks north of Chambers Street. "There were a thousand reasons for the deal not to happen," Mr. Levine recalled. Then pieces started falling into place. The Bank of New York wanted to get out early from its lease on the 10th and 11th floors, Mr. Resnick said. The General Services Administration made it clear that it would not renew its lease on the 12th and 14th floors when it expired in 2005. Donnelly sublet some of its space on the second floor to create the crossover lobby. Space was taken back from the garage to create the Murray Street entrance. "By September, we will be there offering classes," Dr. Pérez said. "My instinct is that B.M.C.C. has found a home in this building." That, of course, was what the college thought in 1993 when it was given the building at 30 West Broadway by its owner, Mr. Fiterman, a co-founder of Miles Homes in Minneapolis. The company became the largest nationwide supplier of prefabricated homes and was sold to the Insilco Corporation in 1972. Mr. Fiterman's building was developed in the late 50's by Erwin S. Wolfson, primarily to house the stock transfer division of the Guaranty Trust Company. Designed by William Lescaze, a prominent Modernist best known for the PSFS tower in Philadelphia, the building bears two hallmarks of the period: white bricks and ribbon windows. On acquiring the building, the college began using it for classes immediately, said Edward J. Sullivan, the director of operations, planning and construction. Then it undertook a $65 million renovation by Hardy Holzman Pfeiffer Associates. Completion was scheduled for Oct. 31, 2001, Mr. Sullivan said. Fiterman Hall would have provided space for about 4,500 students during the day, or roughly one-quarter of the total enrollment. Asked his feelings on the pending demolition of something he had designed, the architect Hugh Hardy likened it yesterday to a kick in the teeth, even if it was made inevitable by the structural damage, the contamination and the mold. "The tough thing is that we were so close," Mr. Hardy said. "It was literally another month or so. So many people had tried so hard to make it work." Among the flourishes Mr. Hardy's firm added during the renovation was a curving, backlit, perforated aluminum marquee with "Fiterman" in big block letters. It is still visible behind the barricades that now surround the ruined structure. Other parts of the building, however, were destroyed by the collapse of 7 World Trade Center. While walking around Fiterman Hall on Monday, recalling the attack and its aftermath, Mr. Sullivan was asked to point out where his office had been. "It's gone," he said simply. "It's on Staten Island." REAL estate players and downtown advocates are livid over the logjam that's holding up the repair or reconstruction of Fiterman Hall, the college building damaged on 9/11, which is still a blackened hulk right next to Larry Silverstein's new $700 million 7 World Trade Center. "Its continued presence in dire condition is a question mark that needs to be removed from Lower Manhattan," warned CB Richard Ellis downtown office honcho Bruce Surry, who helped broker the Fiterman family's donation of the building to CUNY in the 1990s. As The Post has reported, CUNY, which owns the 15-story unit of Manhattan Community College, wants state funds to raze and rebuild the burned-out hall, claiming its insurance proceeds and FEMA money leave it $56 million short of $161 million needed to replace it. But both the city and the Lower Manhattan Development Corp. believe the hall can be repaired with funds CUNY already has — an option they say the university is ignoring because it wants a new building entirely. Brokerage sources said the macabre eyesore is having a "poisonous" effect on Silverstein's campaign to find tenants for 7 WTC, which faces the CUNY building on two sides. Downtown Alliance head Carl Weisbrod called Fiterman "a building that needs an immediate strategy — now. Every other damaged building downtown is either being restored or coming down or replaced. This is the only one that seems to be paralyzed." Kathryn Wylde, president of the Partnership for New York City, the leading business-advocacy organization, says: "As far as a sense of confidence on the part of employers, employees, and prospective tenants, the shell of Fiterman Hall standing there sends a very negative message about the pace and trajectory of development." And Kent Swig, a major downtown owner who last week purchased 44 Wall St., said, "Anything that isn't resolved as a result of 9/11 puts a pall on everything downtown." Deputy Mayor Dan Doctoroff, who said recently he didn't think Fiterman Hall needed to be rebuilt, did not return a call yesterday. LMDC officials had no comment, but sources said the agency was no more inclined than before to pay for rebuilding the hall. CUNY communications chief Jay Hershenson had no immediate comment. CUNY, which owns the 15-story unit of Manhattan Community College, wants state funds to raze and rebuild the burned-out hall, claiming its insurance proceeds and FEMA money leave it $56 million short of $161 million needed to replace it. They should rebuilt that awful looking building. I hope they get some kind of fund or some sort of outside help. That building never look good in that area in the first place. The fate of Fiterman Hall in Lower Manhattan, which has been unclear since the building was badly damaged during the attack on the World Trade Center, may be settled this month with a choice of architects to design its replacement. Pei Cobb Freed &amp; Partners, a downtown architectural firm that designed the Jacob K. Javits Convention Center and is working on the new Goldman Sachs headquarters in Battery Park City, has been recommended for the Fiterman Hall project to the board of trustees of the City University of New York, which will vote on the matter in three weeks. Fiterman Hall serves the Borough of Manhattan Community College, a unit of CUNY. Estimates to replace the building have ranged up to $274 million, though it may be lower. Insurance will pay for some of the project, but full financing - perhaps the key impediment - has not been entirely settled. Jay Hershenson, the vice chancellor for university relations at CUNY, declined to discuss specific dollar amounts yesterday. But in an e-mail message, he expressed the university's commitment to reconstruction. "We are moving ahead because there are sufficient funds in place to construct the building, although this will fall short of our ability to complete several critical floors," Mr. Hershenson said. "This will be a serious hardship for the students, but the damaged facility is an eyesore and inconsistent with the revitalization of Lower Manhattan. We are hopeful that the state and city will help us complete the project." The new building will house classrooms, computer laboratories, offices, a library and assembly and meeting rooms, according to the CUNY board's calendar for Nov. 29. Space will total 377,000 square feet. The existing Fiterman Hall, 30 West Broadway, was built in 1959 as a 15-story office building, with 300,000 square feet. It was donated to the community college in 1993 by the philanthropists Miles and Shirley Fiterman and was being renovated as an academic center in 2001. The $65 million project was only seven weeks from completion on Sept. 11, when 7 World Trade Center collapsed across Barclay Street, tearing away whole parts of Fiterman Hall, setting fires inside and piling up rubble against the facade. Since then, a new 7 World Trade Center tower has risen. Last month, still under construction, it reached its full height of 52 stories. Fiterman Hall, however, remains a wreck. Much of its south facade is exposed as a structural skeleton, sections of white brick alternating with gaping dark holes. Black netting shrouds some of the building. Though best known as I. M. Pei's firm, Pei Cobb Freed is a partnership of designers with distinctive styles. Several years ago they moved their office from Midtown to 88 Pine Street, at Maiden Lane, a tower the firm designed in the 1970's. "Their experience should be very helpful in moving our process more quickly," said Antonio Pérez, the president of the Borough of Manhattan Community College. "This is really an opportunity for our institution to be perceived, from a building perspective, as an integral part of the new face of downtown." Mr. Fiterman died in June, but Mrs. Fiterman was "very excited" to hear that the college was moving forward, said their son, Steven C. Fiterman, a real estate developer in Minnesota and Florida. "Now, it's even more important that that site have not just a business element but a teaching element," the younger Mr. Fiterman said. "It's really important that education have a place in that part of town." His support for rebuilding the Borough of Manhattan Community College’s Fiterman Hall, which was damaged in the attacks. Antonio Pérez, the school’s president, told Downtown Express that the school has about $127 million in insurance and Federal Emergency Management Agency money and needs $60 million more for the demolition and reconstruction costs. The college’s board is expected to vote to hire Pei Cobb Freed &amp; Partners to design the new Fiterman. Little has changed in the three and a half years since Fiterman Hall at Borough of Manhattan Community College was damaged by the collapse of 7 World Trade Center. The building still stands at 30 West Broadway, shrouded and awaiting its fate. Even after B.M.C.C. president Antonio Pérez spoke about plans to demolish it at a W.T.C. committee meeting this month, it is still entirely unclear how, when and under what circumstances the 15-story building will come down. Demolition plans are sketchy. The university retained the architectural firm Pei Cobb Freed &amp; Partners to draw up plans to demolish the building and design a new building in its place. Pérez said it would take up to a year to devise a demolition plan and four years to rebuild. He did not know how long it would take for Pei Cobb to come up with a design for a new building. The firm has also designed the proposed Goldman Sachs headquarters planned for Battery Park City. Catherine McVay Hughes, a committee member and the community liaison for the Environmental Protection Agency’s W.T.C. Expert Technical Review Panel, expressed disappointment with the long timeline. “Why is the process of taking that building down so slow? It’s just unbelievable that 4 Albany St. will be gone by Memorial Day and there will still be no progress on Fiterman Hall,” she said, referring to the demolition of the Deutsche Bank-owned Albany St. building that stood untouched — damaged and contaminated by the W.T.C. disaster — until last month. This week, Gov. George Pataki set aside $20 million in his budget — money that must be approved by the State Legislature — for the demolition of Fiterman Hall. Pérez estimates that it will cost the university $180 million to completely rebuild. The university has already secured $126 million. Although Fiterman Hall is a B.M.C.C. building, CUNY will ultimately take the lead in the building’s demolition, said Pérez, determining when and how the demolition will take place. Emma Macari, vice chancellor of facilities and planning for CUNY, did not return repeated calls for comment. The Dormitory Authority of the State of New York is ultimately responsible for tearing down or restoring the building, but officials there have not received word about the building’s fate. “So far as I know, there has been no decision on what’s going to happen to Fiterman Hall,” said Claudia Hutton, a spokesperson for the authority. Before the Dorm Authority can take any action whatsoever, it needs the approval of the State Legislature, which it has yet to receive. “You don’t undertake capital projects without getting it O.K.ed by the State Legislature,” said Hutton. She was unaware of the $126 million that B.M.C.C. had acquired for the project, but insisted that any money spent on a CUNY building — including the governor’s $20 million allocation and the school’s $126 million — must be approved by the Legislature. The building, donated to the college, had just completed a $62 million renovation when the events of 9/11 shattered it. “All of this money was spent to rehabilitate it and if 9/11 hadn’t happened, you would have been in there using that space,” said Hutton, who is not convinced the building needs to be demolished at all. “When you have an opportunity to do something very different, I can understand that you might want to do something different,” she said. But renovating the building would be far less expensive than building anew. Fiterman Hall has stood empty and untouched primarily because of financial wrangling. After three years of haggling with the building’s insurance company, FM Global, CUNY finally received a $90 million settlement in 2004, $27 million of which went to cover the cost of temporary classroom space. “We didn’t have the money in order to start the project and we finally said ‘We can’t wait until we have all the money, we have to start now and build what we can under the circumstances,’” Pérez said. Madelyn Wils, C.B. 1 chairperson, suggested B.M.C.C. look to the Lower Manhattan Development Corporation, the state and city agency responsible for demolishing the W.T.C.-disaster contaminated Deutsche Bank Building, as an example of an open review process. “It is appropriate that we ask the chancellor and the president what they’re doing and what their plans are” for Fiterman Hall, said Wils at a Jan. 18th full board meeting. After nearly four years there is movement to finally bring down Fiterman Hall. 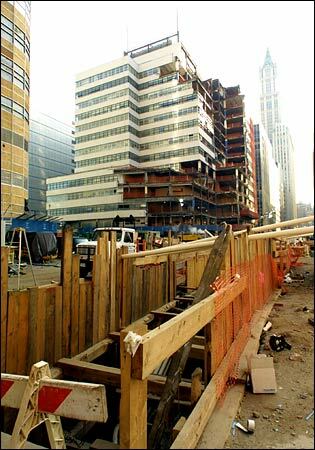 The Borough of Manhattan Community College building at 30 West Broadway was badly damaged in the Sept. 11 terrorist attacks by falling debris from neighboring 7 World Trade Center. In the years since, the building's structure has been shored up and the holes in the façade plugged. But the building's interior, presumably loaded with dust from the World Trade Center, has been left untouched. "We're going in with the assumption that the building is contaminated throughout," Ben Lewis, an air quality consultant, told Community Board 1's World Trade Center Redevelopment Committee on July 13. Few have been in the building since it was shuttered. The architectural firm of Pei Cobb Freed & Partners was selected by the City University of New York to provide cleanup and demolition of the structure. Lewis, hired by the architects, said his team is still awaiting a clearance from the building's owner, the New York State Dormitory Authority, to set foot inside-an approval that could come this month, he said. Lewis told the committee he expects to find dust from the World Trade Center, asbestos containing building materials, and perhaps mold. He anticipated that results of the testing and a subsequent decontimation plan could be completed by the fall and forwarded to the Environmental Protection Agency and other agencies, including CB1, for approval. The project is likely take cues from similar deconstruction efforts at 130 Liberty St. and 4 Albany St. Those involve careful handling and hauling out of building materials and a piece-by-piece disassembling of the building. Similar air monitoring devices in use at 130 Liberty and throughout Lower Manhattan would be installed in the building as well. "We don't want to reinvent the wheel," Lewis said. There will likely be a 6-month period of decontamination of the building before a 5- month deconstruction effort begins. "We're looking forward to this going smoothly and quietly and hopefully you won't even know we're there," said Andrew Bachman, a vice president with Tishman Construction. The $185 million project got a much needed boost in May when Gov. George Pataki announced that $15 million of the remaining federal block grant funds of the Lower Manhattan Development Corporation would be set aside to raise and rebuild the structure. The remainder will be paid fund with a combination of state and city funds and a $90 million insurance settlement. Until Sept. 11 the 15-story building had served as off-campus classroom space for BMCC. A $62 million renovation of the building's interior was nearly complete before the attacks. Plans are to build a new 377,000-square-foot structure to house classrooms, computer labs, offices, library and meeting rooms. "The building probably could be fixed," Bryan Cave, an attorney representing CUN told the committee. "But it would be more cost effective to rebuild."